Published: Apr 6, 2012 to ? A heartwarming story about the daily lives of a freeter named Yuuya and his two part cat, part human pets. This will be a short review, because it's a short manga. Nukoduke! starts off with the MC, Yuuya, finding two abandoned Nukos calling out for someone to take them. What is a Nuko, you ask? To put it simply, it's a species of cat that evolved to be more human-like. Anyways, after a little bit of dialogue between them and some rain, Yuuya decides to take the two home with him. The following chapters turn in to a slice-of-life comedy about Yuuya taking care of the Nukos, and the cute things the Nukos do. While the latter is typical in SoL comedies, the parts where Yuuya is taking care of the Nukos are pretty heartwarming. And there's quite a bit of them, so that's always good. So, summarize an already short review, Nukoduke! is a nice, enjoyable little manga that will make you "D'aww" a lot. If you enjoy funny and/or adorable things, you should really give this a shot. 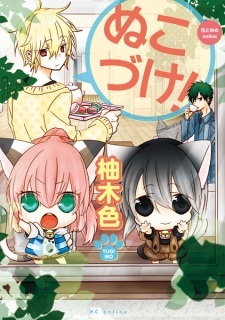 If you are looking for a manga about cute animal, Look no more. This is the manga for you. Basically this manga is a Slice-of-life kind of manga in an alternate world where cats evolved into more human-like creatures. The concept of human-like cats will leave you wanting more or even wanting the actual thing.... like me. If you are ever frustrated, negative or emotional, read this manga. I can guarantee that it'll sooth your soul with its cuteness. This manga is, in my (most probably biased) opinion, probably the best manga I've read. I liked it so much that it's the first manga/anime that I actually bothered to even write a review for. Being as vague/as "non-spoily" as possible, the comedy, window into daily life, cuteness, and "feels-y-ness" all combine together to form a masterful piece of art. One of the reasons I liked it so much probably has to do with the whole perspective/relatability of the title. Amane Yuuya is 20 years old, and personally, I'm not that much younger than him. I can relate to him, and I can understand what it's like to have pets and/or raise children, to an extent. Also, the emotions manipulated were mostly balanced, though they did tip over to the enjoyment side more (almost gave story a 9 because of that). The story has certain parts which can make you all sad and bittersweet, but they get balanced out with the excessive heartwarming moments. Overall I think this manga is definitely worth a read, especially to pet owners since the mangaka styled Sasame/Kana/Kei after observing real-life animals' behaviors, to an extent. To start with, my dear friend recommended this to me and I am grateful to her because this is one of the best manga that I have read. Why I said so? 6. The nukos are so Kawaiiiiiiiiiiiiii!! 8. The nukos are very adorable and I really want to have one!! The only thing that I do not love is that it is SHORT!!! It just consist of almost 9 pages every chapter Oh man! But on the brighter side, even though each chapters is short it does not stop the enjoyment and cuteness overload that this manga offers. I love almost all of the things that this manga have and because of this I wish that nukos are real and they are available in every pet shop because I would definitely buy them even they are expensive!! I really do think that my review is not enough to describe this specially cute manga so it is up to you to read it and I really do hope that this will get an anime adaptation because I will definitely without any hesitation watch it!! - To the author who wrote this manga Thank You So Much!! - To my friend who introduced this to me I Love You!! The Top 10 Cutest Manga Ever! Disclaimer: The manga listed in this article contain dangerous quantities of sweetness. We here at MyAnimeList are concerned for our reader’s safety, and strongly recommend seeking treatment for diabetes after reading any of these titles.